In achieving his 1994 gun ban, Bill Clinton's deft use of the White House bully pulpit underscored the truth of Mark Twain's aphorism: "A lie can travel halfway around the world while the truth is putting on its shoes." ith 2004 in full swing, it's time to survey the landscape and prepare for the battles that lie ahead. There will be no shortage of them as the year plays out. First and foremost, 2004 is a general election year. On Nov. 2, Election Day, voters will choose candidates in races from the local level all the way to the White House. All 435 members of the U.S. House will be on the ballot, as will 34 members of the U.S. Senate. 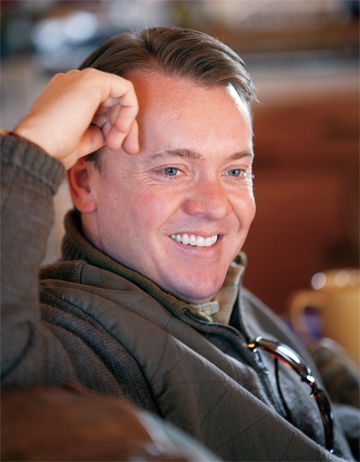 And don't forget the nearly 10,000 races for state legislative office from coast to coast. The upcoming election will color the decisions of nearly every elected official in the country over the course of the year. Candidates across the country will be attempting the high-wire act of appealing to the majority of the electorate without drawing criticism or opposition from their base of solid voters. It is against the backdrop of this political tension that we will face a number of legislative challenges, both in the states and in the nation's capital. HR 2038 would fulfill much of Feinstein's gun ban dream -- it would even ban every semi-automatic shotgun on the market today! Once again,"assault weapons" will be the buzzwords of the year. Remember that the Clinton gun ban of 1994 is slated to "sunset" from the books on Sept. 13. If Congress takes no action to re-enact the law, it will simply expire. But the efforts of the dedicated anti-gun corps to extend the law, and also expand its scope by banning millions of additional guns are, of course, well underway. We need to be prepared for this battle from the very first moment Congress turns to new business for the year. 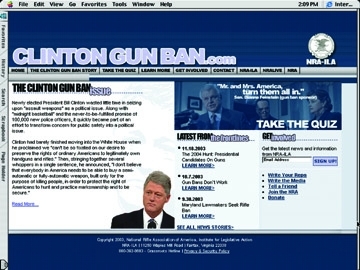 We at NRA-ILA are proud to unveil a new Web site designed as a tool to help us meet this challenge ClintonGunBan.com. Point your Internet browser to ClintonGunBan.comfor a refresher course on the history of the Clinton gun ban. The new Web site stands ready to help every NRA member play a role in spreading the truth. The massive education campaign we need to undertake starts with you, and the site has all the tools you need. Use the site to show non-gun owners the truth behind the big lie of the Clinton gun ban. Bookmark it for frequent vists to check new content, and send it to every person you can think of who could use some education on the issue. Desperate to attract support from moderate middle-class voters in the suburbs for his reelection, Clinton seized upon the phony issue of "assault weapons." With willing accomplices in the media who parroted the anti-gun lies, Clinton's deft use of the White House bully pulpit underscored the truth of Mark Twain's aphorism: "A lie can travel halfway around the world while the truth is putting on its shoes." Clinton paired his campaign of lies with personal arm-twisting to force the ban through Congress by the slimmest of margins. The truth has now had 10 years to catch up to the lie, and even anti-gunners can't argue that the law has been effective. Study after study has found the Clinton gun ban to be utterly irrelevant to the real issue of criminal misuse of firearms. But the enemies of freedom are arguing that it should not only be renewed, but also enormously expanded in scope. on the history of the Clinton Gun Ban. Not content with merely re-authorizing the ban, Reps. John Conyers, D-Mich., and Carolyn McCarthy, D-N.Y.,have introduced HR 2038, legislation that bans millions more guns. Passage of HR 2038 would move a giant step closer to the goal stated by original Clinton gun-ban sponsor Sen. Dianne Feinstein, D-Calif., who told CBS's 60 Minutes: "If I could have gotten 51 votes in the Senate of the United States for an outright ban, picking up every one of them, Mr. and Mrs. America, turn them all in, I would have done it." HR 2038 would fulfill much of Feinstein's gun-ban dream--it would even ban every semiautomatic shotgun on the market today! But I bet your duck hunting buddies don't know that. We face the very real risk that public ignorance and media pressure will combine to leave some lawmakers feeling vulnerable if they vote to protect our rights. The new Web site stands ready to help every NRA member play a role in spreading the truth. The massive education campaign we need to undertake starts with you, and ClintonGunBan.comhas all the tools you need. There is a brief video that outlines the history of the Clinton gun ban, along with fact sheets and breaking news items relevant to the debate. Sign up for free e-mail action alerts. An integrated feature will allow you to contact your elected representatives directly and also write letters to your local media. There is even a lighthearted quiz designed to make it fun and easy for anyone, even non-gun owners, to see the truth behind the big lie of the Clinton gun ban. Check out the site, bookmark it for frequent visits to check new content and send it to every person you can think of who could use some education on the issue.